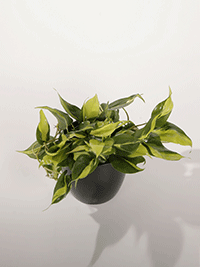 Most commonly used varieties: Cordatum, Heartleaf philodendron, Split-leaf, Selloum, Congo red and green. Upright climbing or cascading vine. These lovely plants tolerate a wide range of lighting conditions. Leaf size and growth is reduced in poor light conditions. In their native environment they are epiphytic plants that grow up, clinging to trees searching for the light. In the interior they do best in bright indirect and will survive in low light. 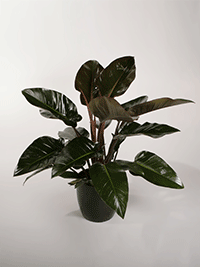 Philodendrons have big, thick roots and store water in them. Too much and they will rot. They like to have a big drink then dry back until the surface soil is dry. Do not keep them overly wet. 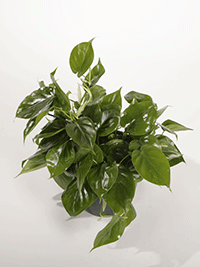 All Philodendrons have thick almost waxy leaves that tolerate dry indoor conditions. Let all Philodendrons dry down between waterings. They are a vining plant and can get long and scraggly if not cared for. Prune the tips from time to time to keep them bushy and full. They need fertilizer infrequently perhaps once or twice per year. These true tropicals do not tolerate cold and will rot if the environment is persistently cold and drafty. Remove blooms as they begin to appear. The energy from the plant needs to stay for growing leaves not the flowers. These plants look best when kept clean. Dust them frequently and wipe their leaves to bring out their natural shine. Mealybugs love them. Repeated sprays with soap or Brand X and hand wipe with diaper wipes. Thrips can live inconspicuously for years slowly destroying these plants. Usually by the time you discover the thrips they have infested the plant to the point it needs to be replaced.